This is a hall table I just finished for my wife. I finished it with danish oil and polyurethane, hope you guys like it. Thanks, yeah she liked it. good combination of wood. I may have to try one myself. good job. Yes, I like to contrast, nice build! Beautiful combination of woods, excellent design and execution. Fine work! 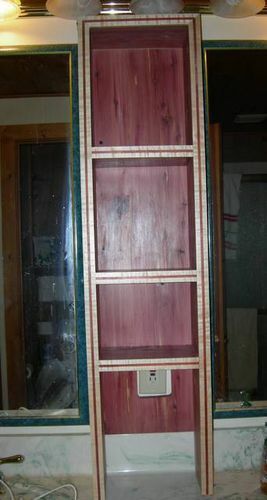 I also like combining different woods, here is a cedar cabinet trimmed with a padouk inlay in curly maple. Nice build Bailey. Very well executed. Will the miter joints split when the maple board expands wth seasonal movement? I hope not I kinda cheated on them. I used pocket hole screws with glue to make them stronger. Looks great!!! Is the top veneer? Hey great looking table, colors work very well together as well as style and size. It’s gone into my favorites as it’s definitely awesome. And it is very similar to a project I’m working on. Thanks guys, no the top isn’t veneer. It was some curly maple I had left over that a friend gave me. I planed it down to about 3/4”. Very Nice Work indeed Bailey! Thanks For Sharing! Beautiful. I love the wood combination. I need to learn a lot more about wood movement so I understand more what some of the others are talking about. I know the basics but I always need to know more. Great looking piece.